Other Types of Massage Benefits Is It Painful? The hallmark of hot stone massage is the use of the heated stones. Basalt river rocks are typically used because they are smooth (from the river's current) and retain heat well. The hot stones are smooth and typically several inches long. The stones should be warmed using a professional electric massage stone heater so that the temperature can be controlled. 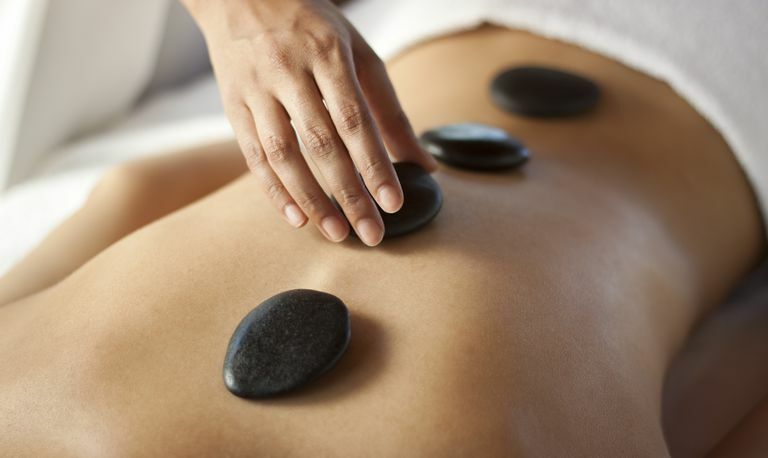 If the stones are too hot or uncomfortable, be sure to let the massage therapist know immediately. Stones that are too hot can cause burns. The heat of the stones allows the massage therapist work on deep tissue, if needed. As with any massage, however, massage therapy shouldn't hurt and you should tell your massage therapist if you feel any pain. Small stones may be placed between the toes or on the forehead. After the stones are placed on your body, it may take a few minutes for the heat to penetrate the sheet or towel so you can discern whether the stones are too hot. The therapist applies massage oil to the skin. Holding stones in both hands, the therapist uses gliding movements to move the stones along the muscles. The therapist uses Swedish massage techniques on the back, legs, neck, and shoulders while the stones are in place or after they have been removed. While hot stone massage is generally considered safe when performed by a trained and licensed massage therapist, it's not right for everyone. Consult your doctor if you have a medical condition, such as high blood pressure, diabetes, heart disease, varicose veins, migraines, autoimmune disease, decreased pain sensitivity, cancer, autoimmune disease, epilepsy, tumors, or metal implants, or are on medication that thins the blood. Also, check with your doctor if you have had recent surgery or have recent wounds or areas of weakened or inflamed skin. To prevent burns, a professional massage stone heater should be used (microwaves, ovens, hot plates, and slow cookers should never be used). Whether you're trying massage for the first time or are already a fan and interested in trying something new, talk with your massage therapist (and healthcare provider) about whether hot stone massage is appropriate for you. While many people find the warmth deeply relaxing and beneficial for the mind, body, and spirit, you also want to make sure that it's the right type of bodywork for you—especially if you have a health condition or injury. Don't eat before your massage. Stay hydrated by drinking water before and after your massage. Let your therapist know if the stones are too warm or the pressure too intense. See a licensed massage therapist trained in hot stone massage. Be thorough when completing the intake form.